Started in 1560 by Aritsugu Fujiwara, a skilful sword maker who had long made swords for the Imperial family, Aritsugu began making kitchen knives, and wood chisels for Buddhist carving in the relatively peaceful Edo period (1600-1868). In the Meiji period (1868-1912), they started to make high quality steel and copper cooking pots, and other special accessories for the Japanese kitchen. Many of the items displayed in Aritsugu's gleaming shop could be used in any kitchen in the world, but a great number of their products are uniquely suited to the highly-specialized world of Japanese cuisine. For example, how about a gleaming, copper-lined cedar box with a built-in charcoal burner for yudofu (hotpot) cuisine. Or for something even more exotic, how about a sharkskin grater for grating wasabi (green horseradish), used to add that hot kick that good sushi is known for. Or how about a tiny bamboo brush for flicking just a touch of piquant yuzu (Japanese lime) on dishes just before serving them. But more than anything, Aritsugu's specializes in Japanese knives, which it sells to cooks all over Japan and countless cooking fans from around the world. The distinguishing feature of Japanese knives is their razor-sharp edge. While Western knives are sharpened on both sides, traditional Japanese knives are only honed on one side, yielding a super-fine edge. Using even a slightly dull knife will discolor food. For this reason, Japanese cooks and foreigners who pride themselves on such subtleties, keep their Japanese knives razor-sharp, a process which takes a fair bit of time on a regular basis. Japanese knives, known as wa-bocho, can be roughly classified into four categories: 1) Long, narrow bladed yanagi-bocho, used to prepare uncooked fish. 2) Medium-length, thick deba-bocho, used to chop fish and meat. 3) Rectangular-bladed nakiri-bocho, used to finely slice or chop vegetables. 4) A wide range of special knives, with all kinds of blade shapes and designs, which are used for specialized cuisines. As you would expect from a master maker, Aritsugu offers free, lifetime repair on any of their knives (provided that the knife has been properly used). Their clear and comprehensive English brochure explains the basics of proper knife care and maintenance, and the conditions on its lifetime repair guarantee. Aritsugu is located on the north side of the Nishiki Food Market, just west of Gokomachi. The shop is open from 9:00-17:30, every day of the year. Tel: 221-1091. 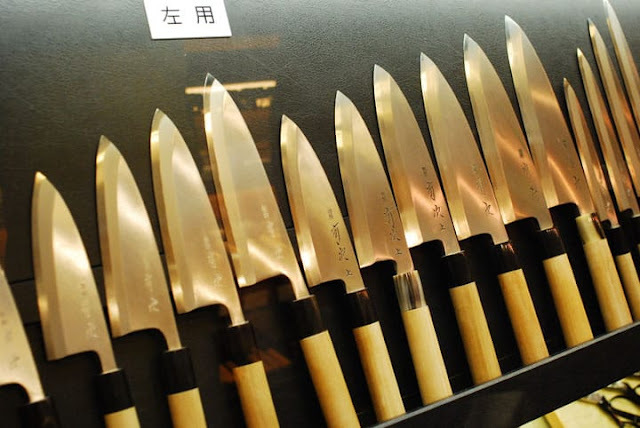 Your Japan Private Tours (YJPT): How is a Japanese knife made? Terakubo: In spite of advances in modern-day technology, the techniques used in making kitchen knives have hardly changed since ancient times. Today, just as in the beginning, only a craftsman's dexterity can be relied upon. Making Japanese knives is far from an efficient profession. A craftsman can only make about 15 knives in a single day. First the iron for a given knife is repeatedly heated until it becomes red hot and then quenched and tempered in cold water. In the second stage the dimensions of the knife are decided on and, it is filed down to size. Then the blade of the knife is honed to a perfect edge. The surface is then planed with a harder steel to yield a shiny finish. Finally, the knife is heated again, coated in mud, and plunged red-hot into cold water. This last stage, before our name is inscribed on the blade, is a ritual that we think of as the birth of the knife itself. YJPT: Where do you make your knives, and how long can a good traditional Japanese knife be used for? Terakubo: We have two factories. One in southern Kyoto and one in Osaka. Our craftsmen make nearly everything that has to do with the traditional Japanese kitchen, not just knives. A good knife will last at least 20 years, but you have to use it properly. Today, there are many shops selling knives in Japan, but very few of these businesses sharpen or repair knives. We do. In the old days, few people could afford to go out and buy another knife. Things were made to last and last and last. We are the oldest knife shop in Kyoto, and we still take great pride in offering superb service, like we always have. YJPT: What kind of people buy your products? Terakubo: Almost 80% of our customers are not from Kyoto, and of those customers nearly 60% are ordinary people. Our other customers, as you might have guessed, are professional Japanese cooks. We also have a lot of customers from France, Germany, and the United States, who buy our knives to prepare fish and cut vegetables perfectly. 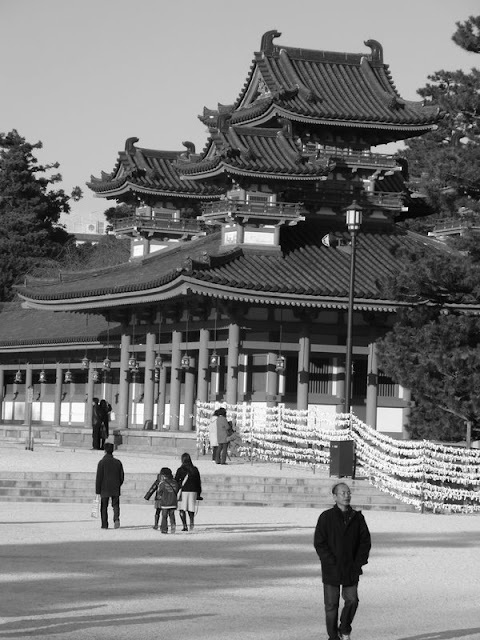 YJPT: How do you feel Kyoto has changed over the last few decades? Terakubo: The townscape has definitely changed. Too many old townhouses have disappeared and younger generations have lost a sense of the traditional seasons of Japanese interior life. In the old days, we used bamboo blinds and opened all the windows in the house to keep it cool. Air conditioning has denied people the natural wonders of summer. Even temples have air conditioners. Today, you can eat winter dishes when ever you want. 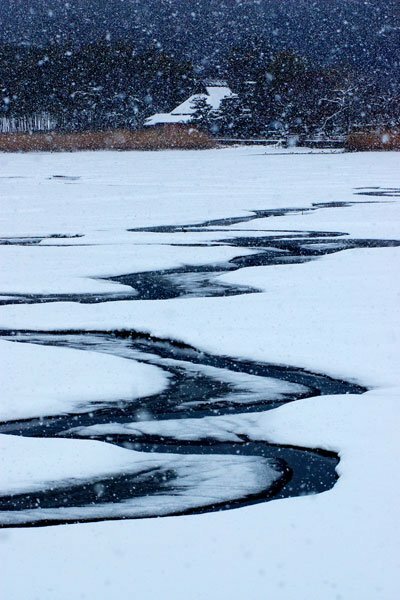 The Japanese have become very affluent and technically advanced, but also much more selfish, less family conscious, and more ignorant about the ways of nature. To lose the wisdom of the seasons is to forget who you are and where you come from. YJPT: How has the Nishiki food market changed? Terakubo: Well in the last few years, nearly 10% of the shops have disappeared. A lot of the people on this street are tourists now, and so it has become difficult for traditional food businesses to remain in business. Old shops also often have a difficult time finding successors to run the business. But this street is 400 years old and its spirit remains strong. We all work together to keep it alive and vital. YJPT: Do you have anything you personally would like to say to our readers? Terakubo: I think it is important for tourists to be more curious. Ask more questions when you walk around Kyoto. People who are running the old Kyoto shops know a lot about many things, and they want to share what they know with people from other cultures. If you are shopping in this area, come and ask us to help you. Even if it is a simple question, we can learn more about each other. This interview was conducted in late 1999 by Ian Ropke, Japan travel expert (since 1990). For more about Ian's work visit www.kyoto-tokyo-private-tours.com or Google me. Thank you . . .